In pulling out of plans for HQ2 in the Big Apple, Amazon has met a force it can't overcome. Facing the kind of political opposition and media scrutiny that only comes in New York, New York, the giant folded. Amazon’s vagabond shoes were longing to stray. Right through the very heart of it — for a big talent pool and even bigger incentives from New York, New York. If Amazon’s bigs could make it there with HQ2, they’d make it anywhere. On Thursday, the company announced it won’t be going to the City That Never Sleeps. Facing the kind of political opposition and media scrutiny that only comes in the Big Apple, the giant folded. This is good news for Seattle, barring some astoundingly destructive policy out of the City Council. Amazon’s aspirations for a second headquarters, the “full equal” to Seattle that it originally announced, began shrinking months ago. Thus, the announcement in November that HQ2 would be split between the Queens neighborhood of Long Island City and Northern Virginia. Even so, the move might have represented a long-term risk to Seattle. Now, although Amazon will hire in Virginia and elsewhere, Seattle evidently will remain the unrivaled center of gravity. That matters for attracting talent, generating tax revenue, benefiting vendors and partners, and spinning off startups. Most important: The big decisions involving capital, hiring and innovation will be made here. And we got this bounty without tax incentives. The company grew from a suburban house to a global powerhouse organically. Sure, I’d like a country with smaller, competitive companies, no market giants that also wield enormous political power, more vibrant local economies and loads of real stores on the street — the America I grew up in. But that’s not the world as it is. And in this world, I’d rather have the headquarters of two of Big Tech’s Big Five in the Seattle area. We benefit enormously. Gov. Andrew Cuomo and Mayor Bill de Blasio — both Democrats but often bitter enemies — worked hard to win HQ2. That included $3 billion in city and state tax incentives. 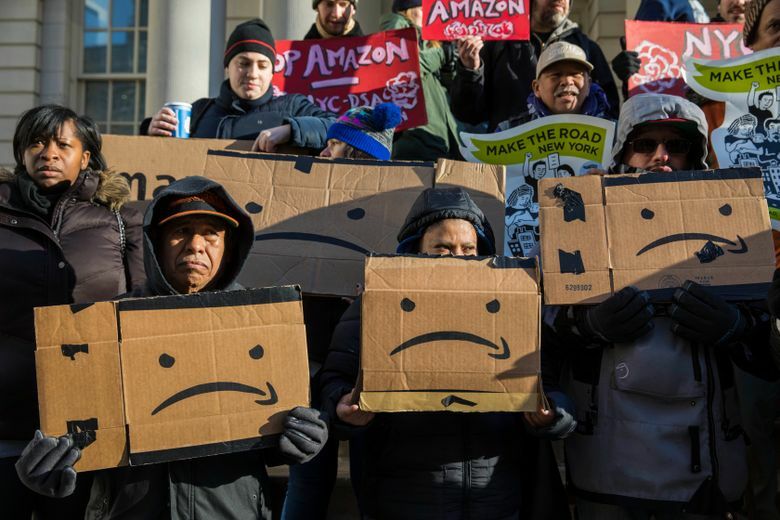 But the opposition was quick to form, with Amazon catching fire for a range of sins: From demanding what critics saw as corporate welfare, to opposing unions, to its effect on transportation systems and relatively sleepy Long Island City. “Amazon refused to change and accept New York values,” Councilmember Jimmy Van Bramer, who opposed the HQ2 plan, told The Wall Street Journal. Did Jeff Bezos always want to be in New York City? Probably. But in this case, he miscalculated. Unlike almost all of the 230 localities that submitted proposals for HQ2 — which originally promised 50,000 well-paid jobs and $5 billion in investment — New York, New York doesn’t really need Amazon. The city is the unquestioned monarch of finance, corporate headquarters and much of the entertainment sector; home to some of the best universities; host of world-class amenities. King of the hill. Top of the heap. It’s doing fine in tech, as well, and Amazon will no doubt continue to do some hiring there. During the HQ2 competition, urban scholars condemned Amazon’s demand for tax incentives. And they’re right, in theory. Giving one company a tax break is unfair to the other companies that don’t benefit. Indeed, those firms may end up paying more to fill public coffers if the incentivized corporation doesn’t create more benefits than costs. But such high-mindedness doesn’t work in hundreds of cities and towns that lost their economic crown jewels in the massive restructuring of the past 40 years. Their elected leaders are expected above all to bring jobs. (I know, alien thinking to Seattle City Hall). This rarely means such a prize as Amazon, but usually small-ball data centers and the like. Indeed, when a big company threatens your aerospace cluster by holding national competitions to build a new plane, it’s dangerous to shrug and not play. So Amazon- and incentive-haters can do a victory lap. But this is a one-off, made possible by New York, New York’s unique power. Stopping the incentive madness will require breaking up these quasi-monopolies and cartels. As well as passing laws that prevent major companies from playing states off against each other.